Info: Raids will open in a new window. Please note that a the info above may say that there's more free spots then there actually is. Click here to open the forum in a new page. Will add screenshots in the morning for Staghelm & Alysrazor! In the excitement yours truely (Nighty) forgot to do kill shots.. :-/ I wanted to see the whole bridge thing! And by the time we got back the bird was gone! Do'h! Next up - Mr. Staghelm & Ragnaros! In patch 4.3, we'll be introducing worgen racial mounts to the stables of Azeroth. 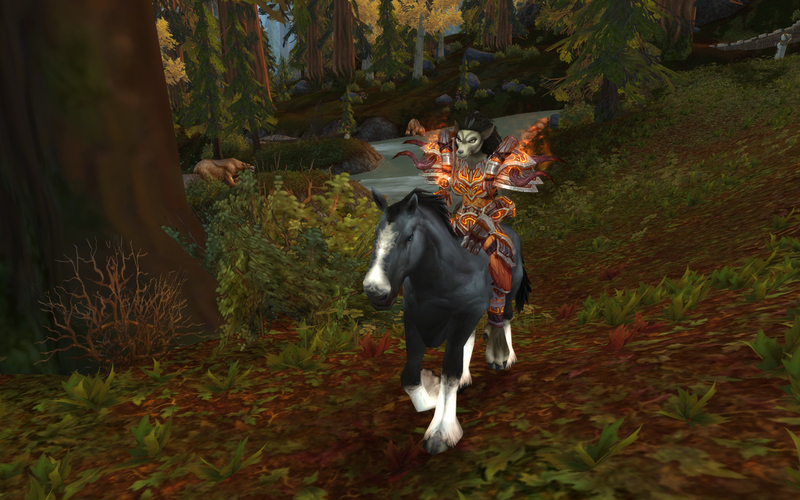 These sleek horses have been constant companions for the denizens of Gilneas since time immemorial, and your worgen characters will now be able to claim their ancestral mounts. 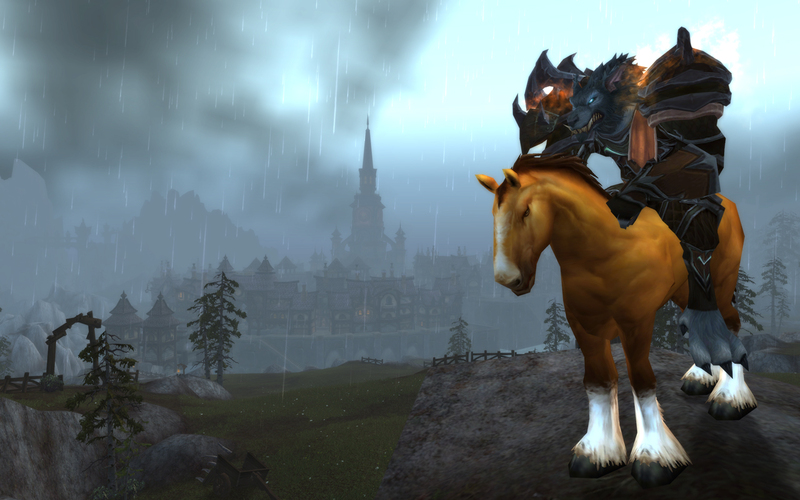 We hope you'll visit the new worgen racial mount vendor to pick out a steed to call your own. World of Warcraft: Cataclysm patch 4.2.2 is now available on all realms! Below you'll find the official patch notes. Updating a raid roster while in combat should no longer cause a client crash. Occu’thar has come into a larger supply of PvE gear than he previously possessed. Hell Hounds should now be nigh impossible for a single player to kill. The Grab Bag dropped by all Firelands bosses should now occasionally contain Crystallized Firestones in Heroic difficulty. Baleroc should now always choose Inferno Blade the first time he casts Blades of Baleroc. Beth'tilac now does slightly less damage on normal difficulty. All threat generated in this encounter has been reduced in Heroic difficulty. Ragnaros’s Sons of Flame should now be immune to silence effects. Shannox, Riplimb and Rageface have all had their damage reduced slightly on normal difficulty. Players should now be able to keep the Quest Giver buff from the quest Welcome to the Machine in Hillsbrad Foothills. Screenshots will be added later/after raid! I've gotten a new computer, most website files are on the old one. I'll get them thrown over one of the days and I'll add the screenshots etc here, yay. Edit: First of all - Sorry for the delay! ... More info will follow tomorrow at some point. Screenshots can be found in Full HD sizes in the Gallery. Breaking news: Nefarian is dead!.. re-dead... died again... Yeah! Edit: Nefarian Lies dead! Phoenix mounts has been bought! Lich king lies dead!... And I now have time to finish up the news! We tried out a new tactic, and a few tries (6 I believe?) and he was a dead dragon! Well him and his sister... for the.. eh.. third time! Bastards sure doesn't stay dead anymore! I'll resize the pictures to about 50% size in a moment. More info & Screenshots will come right after Nighty have had something to eat! I'm updating this news post while listning to Two Steps from Hell, so some epicness may occur in this news post. As you probably guessed it was all a april fools joke, har har! But I'll still let you have the picture of Blackie for another couple of days. Secret picture of Blackfalcon uncovered! The April fools can be found HERE for those whom may have missed it. I've been slacking with the news updates! I know! Cho'gall died Thursday, great job guys! Kill-Shot' up in the Gallery! Neffy & Al'akir. They'll die soon enough! Let me start out with - It's been a awesome raiding week! And great job this week guys! Wednesday we got Baradin Hold, Magmaw, The Trons, Atramedes & Conclave of Wind down. Thursday we had a light evening with Halfus & The Twin Dragons. Saturday we tested out as a new raid evening, and though we started a tad bit late we still got going! The evening ended with Ascendence Council being dead, and poking Cho'gall for the fun of it! Tonight, Monday, we got Chimaeron down, and with 30 minutes of the raid to go we decided to go poke Maloriak, and in just 4 attempts that.. thing(?!) was dead! Sooooo, 9 / 12 bosses down this week, brilliant guys! Oh, and of course a fun try on Al'akir, Cho'gall & Nefarian for the hell of it! Only three bosses stands in our way now! Wednesday Raid started out with Baradin Hold, making quick work of the Pit Lord in there we headed to BWD. Within a hours time or two we had Magmaw, The Trons & Atramedes down, wuhu! Thereafter with 30 minutes left we decided to go poke Throne of the Four Winds for the fun of it, and in some three tries they were lying dead, wuhu! Five bosses in one night, great job guys! Mondays raid went to Throne of the Four Winds, and after a couple of tries we had the Conclave of Wind down! Screenshot will be updated on the Gallery within a days time or two. Tonight we continued with Blackwing Descent! We started out on Atramedes, and had him down by about 21:30, wuhu! Great job guys! We went on to Maloriak after that, and after a few tries we decided that we might require a bit more gearing up for this one, so instead we choose to go to Bastion of Twilight. Here we had some 3 tries on Halfus and then he was a dead panda! Wuhu! Kill Shots can be found on the Gallery. Thanks for a pleasent night tonight guys with 2 more dead bosses! Also the first news of 2011! Tonight we started raiding again, and I know I say this for a lot of people when I go: "Oh I've missed that!" Was great raiding with you folks again! We started out with Bastion of Twilight, got a few good attempts in, though no kills. With about half the night down we decided to change our course and we went into Blackwing Descent instead. In here we quickly got the few trash mobs down and went on Magmaw, great fight. After only a couple of tries he now lays dead! Wuhu! Good job guys! Sadly we forgot to take a killshot, but ah well, he'll die again next week! Thanks for tonight guys and see you tomorrow evening! I've added snow to the website, as you might see. But none the less.. I had to do it! We've decided that January 5th will be our first Raid day for Cataclysm. - I've added raids for the next countless many months on the Raid Planner, go sign up, yay! I've decided to change the News page from the old one to this one now, hope it works for everyone. I'll work on updating the entire list to this new system, yay! I've updated the entire news section to this new design now! I've also updated all links in old posts pointing to our old domain to this current one. - Next up, let's figure out how to form that video page! Alrighty, let's have the video site like this for now..! All our kills are on Warcraftmovies anyways, may aswell let them have the honors! The Video section can be found through the Video link above, or by clicking here - Video. - I've added this fancy new 'News' system looks thing! - Changed the menu links a tiny bit (Positions - Hope you'll live!). - Set up the Gallery as said below. - Removed "Announcements" from the Menu and replaced it with "Shakes & Fidget". This can still be found on the Forum Quick-Menu when you're on the forum page. - Moved the "Wowhead" link and changed the on-site site it links to a tiny bit. From the Forum Size window to the smaller 'News' Size. - Removed "Kill Shots" from the menu (As we now got an actual gallery) and replaced it with the yet to be constructed "Videos". Please send me the videos you have from Nylaathria Raids, or let me know if the site you uploaded it to got a < embed > function. It's got a Login function, and everyone can upload images, image max size is currently 1536KB. The Gallery can be found through the gallery link above, or by clicking here - Gallery. As promised. I'll throw some more on when I have a tad bit more time. I'll add more info about this in the morning, together with screenshots etc! Yay! Tonight Sindragosa & Lich King was planned. Annnnnnnd! We went and two-shotted Sindragosa on Heroic! Wuhu! Awesome job guys! Then we went on to do Arthas with the Achievement, and it's been done! So Frost Wyrms, Wednesday! We're gonna go directly towards Sindragosa! Read up on it please! After the Arthas Achievement we went on to Ruby Sanctum and killed Halion for the fun of it, and then we ended the night with killing Sartharion with 3 Drakes up! Noctizorn won the Black Dragon. So, again, Wednesday guys! Show up with a good mood and let's get our Frost Wyrms! Saturday we went to finish up on Ulduar, just Yogg standing in our way of our pwetty dwagons. Annnnd.. If we had taken a screenshot you'd now have a picture of all our pretty dragons! .. So instead, here's a random picture of our new mount! Sadly we lacked a couple of players for the mondays run (Sindragosa Heroic was planned). - So we decided to gather together what we could and then kill Halion, and so we did. Thursday we got the Professor down, and Dreamwalker, that leaves us at 10/12 Heroic! We also had time for one attempt on Sindragosa where we got her to 26% (Still on Heroic!) where we ended the raid early. Friday evening we went to Ulduar to finish up some Achievements, and we're just lacking Yogg-Saron now for our Dragon! Wuhu! I'll add some Killshots for PP & Dreamwalker a tad bit later. I also decided to update the stylesheet a bit so the page is now about 100% width of the Browser. It's been a great couple of weeks for the raid group! Last week we got a lot of Achievements down, and LK again. ... This week, this wednesday actually(! ), we downed 8/12 Bosses on Heroic - all one-shots! We got the Professor down on about ~3% (first try), Darn close! But he'll die tomorrow, mmhm! For tomorrow I'd love for people to read up on the Professor fight, and also Sindragosa! We've got the Professor, Dreamwalker, Sindragosa & Lich King left this week, if they die tomorrow, we'll head to RS on Monday. Cataclysm has been announced to hit the 7th of December - Exactly 2 months from now. That means that, as like yesterday, this week will be devoted to Heroic Modes, as the 4.x patch will most likely be here by next week - Meaning we've pretty much got to learn our classes all over, meh! But that also means that we'll do something light / easy the first week after the patch for everyone to get comfteable with their new abilities and the likes. So this week will be devoted to do some more Heroic Modes. Tonight will start with Saurfang on Heroic, then moving on to Rotface & Festergut, also on Heroic. I've posted the tactics for these on our forums, so please read up on it! Kill Shots of the, now dead, King. We came, we saw, we succeeded. Downed tonight - 22:44 - 27. September. Prince Arthas Menethil III - Self-proclaimed King. Son of the Honoured King Terenas Menethil II. Training under Muradin Bronzebeard, under the command of the Paladin - Uther the Lightbringer. The Prince who wanted to save his people from the evil demon treats in the city of Stratholme, whom wanted to turn the citys population into mindless slaves. Arthas did this by killing and slaughtering everyone, and then setting fire to the City, leaving it to burn. The, now defeated, Demon Lord Mal'Ganis fled, but before that challenged Arthas to come and face him in the cold north of Northrend. Arthas swore to have his revenge, and from this day on Arthas was a changed person. From here on we all know what happened. Arthas took up the blade of Frostmourne, and in the end became whom we faced this very night. We've successfully removed one of the greatest threat to life in Azeroth from his throne. I've worked on this new design for a couple of days, gone quickly through it's "beta" stage and I believe it to be ready for the world to see! It'll be A LOT easier for me to update with news and the likes. Everything is made for easy / quick updating. The site should now also fit pretty much any Monitor Resolution. Though some things may not look all super when you get down below 1280x1024. The site has been made to fit / work best in Firefox. Atm I've yet to test it with Opera, Chrome, Safari, Mobile Phone Browsers etc nor any such thing. It 'works' in Internet Explorer, but some frames might be misplaced a bit compared to Firefox. - It really ain't easy to make a website that works for all browsers.. Nor all resolutions for that sake. For the Forum & EQDKP I ended up with deciding that they both would require a bigger page then the News/Gallery/Kill Shots page offers. But to add up for this you get a fancy "Forum Quick Menu" & "EQDKP Quick Menu", and these works fantastic if I may say so! - EQDKP is a heck lot quicker to navigate around on, forum too for that sake. - Also if you use the Quick Menu buttons you won't have troubles with the site opening in a new window, which I've yet to figure out where to change for all the links in EQDKP, only got some of them nailed. Annnnnnyways, if you notice any bugs please do feel free to poke me and I'll take a look at it - HighCouncil@Nylaathria.dk. Updated the news side here a tiny bit. Figured out how to add a scroll-bar to the Boxes, also I fixed a couple of other tiny mistakes. If you see any problems please don't hesitate to contact me. Also! It's Raiding Night tonight guys! ICC10! Come prepared, bring flasks, foods and of course a good mood! Remember to sign up on the In-Game Calendar, this will be locked between 16:00 and 18:00 Game Time. There-after it's no longer possible to sign up. When we move to signing up on the Raid Planner (EQDKP) by next week it'll also be like this - with a deadline. With the Raid Planner it's an automated process though. The deadline is currently set to 17:00. Today we sadly lacked DPS to continue in ICC, so Sindragosa & Arthas still lives.. But they'll die Monday! Oh yes! Instead we choose to do a quick trip to TotC10, one shot it all, and call it early. - Lewt can be found on the EQDKP Site. So on Monday, Sindragosa & Lich King, come prepared as always guys! Let me start out with - Sorry for the lack of updates over the past week! Over the past few days I've been busy moving the host from a Windows to a Linux server, which has allowed me to move the forum to our new site, as well as install EQDKP. I'm still fiddling around with all of it, but it should all pretty much work now, so take a look at it! The Forum has gotten a new name for it's cookies, so you might need a few logins before they work correctly and all. For EQDKP I need you to make a user and connect your EQDKP Account with your character! - In the coming weeks time we will most likely be moving the signups to here as it offers more options for us all. As an end note, the forum is now a heck lot faster! And if you have saved the forum URL somewhere you need to update it to www.nylaathria.dk/nyl. That's about it for now! I'll see to updating the themes news in the coming day aswell as to upload loot from the past week. Oh, and feel free to visit the gallery! More instructions on how to use it on the forums. Healers: Emonaie, Stormrise & Shayera. DPS: Millanos, Noctizorn, Cryin, Terann & Asphixious. Today we went on to the Lich King for our very first evening! Although we did not get him down tonight, we did get much futher then I had thought and hoped we would, we got Lich King to ~35%, Phase 3. Which is really impressives for our first night on him if I might say so! And our first week together as a Raid Group! Next raid is scheduled for Wednesday at 19:00. So be prepared with flasks, fish & a good mood guys! And we'll annihilate the place, wuhu! This site is mainly made for Firefox & Opera, at an resolution of 1680x1050. Different themes can be found in the box to your right. Please do know that the site is still a work in progress and updates will occur every now and then. It's Lich King time tomorrow people! Be sure you've read up on him, watched videos about what to do, bring flasks, food and a good mood! Healers: Emonaie, Stormrise & Cammenbert. DPS: Millanos, Noctizorn, Nightzorn, Terakfalcor, Terann. Even though yours truely was late today (Nightzorn), the team still got the Raid up! It started out a tad bit slow with having to PUG a Healer, but we found a awesome one! Thanks for the help Cammenbert! And Emonaie of course who joined in yesterday & today too to help us out. We started out on Blood Wing for the day! And we went one-Shotting The Blood Council, went on to one-shotting The Blood Queen..
From thereon we moved to one-Shotting Valithria Dreamwalker, and we did the Achievement too! Then we went on to Sindragosa and took some tries on her, and we ended with getting her down! Hereafter we called it and took a somewhat 'early' night. Next Raid: Monday! Arthas stands to fall! Come Prepared, Read up on Tactics, Bring Foods, Flasks etc. Click here for list of pretties! Pretties! Click here for Kill Shots! Kill Shots! DPS: Millanos, Noctizorn, Nightzorn, Terakfalcor, Terann & Asphixious. Had a little trouble finding healers for the start of the raid, but we got off only some 15 minutes late, we took it slow as it was our first day together as a team. We had some fun and ended with getting 7 Bosses down, it all slowed down a tiny bit due to one whos interwebs went down, and then having to find a healer replacement. But was fun! Looking forward to tomorrow! First Raid day tonight! Invites Starting around 18:30, Raid at 19:00! Be prepared, bring flasks etc! Wuhu! Also I've added a more Night Elvish skin, which I am still working on, but it's working right now for those who'd rather want that - Click Here. Service Message: 21-12-2010. This style been removed due to design update. It seems like some people got problems registrating to the forums, why I do not currently know, but rest assured that we're looking into it! For the time being, if you should get this error, then please whisper one from the Nylaathria Guild, or send Nightzorn a in-game mail, orrrrr send a mail to nightykk @ hotmail.com and I'll get it fixed in a moments notice. Sorry for the Inconvience. - The Site is currently made for Firefox & Opera. -- IE don't like the use of the frames that I use, or the way I use them anyways. So do not expect, if nothing else, the front page (news) to work perfectly if you should be using Internet Explorer, any version. - The site should also work fine in Chrome, do let me know if this ain't so though (Nightzorn). Also the site is made on a 22" and everything is made to fit for that, so I'm still working on setting everything up right for smaller screens. - For now it'll be like this though. The forum can be opened in it's own window and should scale to your screen if need be. Nylaathria is a new Raid Group, but an old(ish) Guild, dated back from somewhere around the start of TBC. We're yet to have our first raid, but this is set to be the 25th. Currently most people in the RG have at least 11/12, and a couple of Kingslayers, together with having done some tries on Arthas, and also done some Heroic modes. We are currently in need of Healing Role Leader. And, maybe, a Tactical Officer. First Raid is currently set to the be 25th of August. Raid times are 19:00 till 23:00 Wednesday, Thursday & Mondays. Achievements - RG ~ estimate.